An economy where most people work for the state or a global corporation is an economy that has lost its knowledge of the key entrepreneurial building blocks. 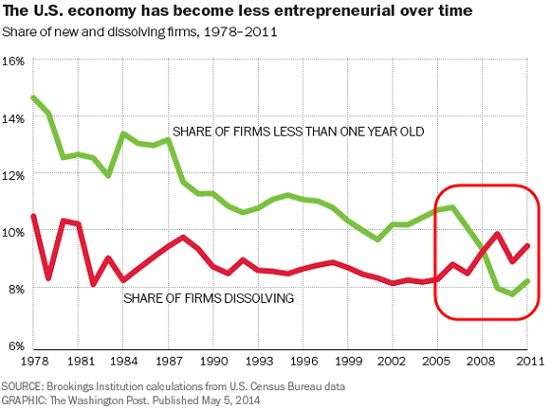 The decline of small business has numerous long-term consequences. One is the decline of the middle class, as entrepreneurial enterprise is a key pathway to generational wealth-building and prosperity. Another is the loss of employment opportunities. As U.S. businesses are being destroyed faster than they’re being created, there are fewer sources of employment. Since many people get their first job at small businesses, the decline of small business has an outsized effect on entry-level employment opportunities. Correspondent Kevin K. identified a third long-term consequence: the erosion of opportunities to learn basic skills with economic value. 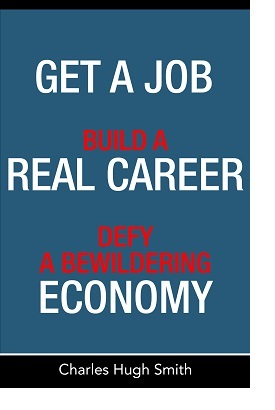 As low-skill work is increasingly replaced by software and robotics, work with a future requires not just higher-level skills but a spectrum of building-block skills and values--what I call the eight essential skills of professionalism in my book Get a Job, Build a Real Career and Defy a Bewildering Economy. Many of these skills are fundamental life-skills that are not taught in classrooms; they are learned on the job. If the kind of jobs that enable the learning of these basic building blocks of economic value go away, so do the opportunities to gain these skills. 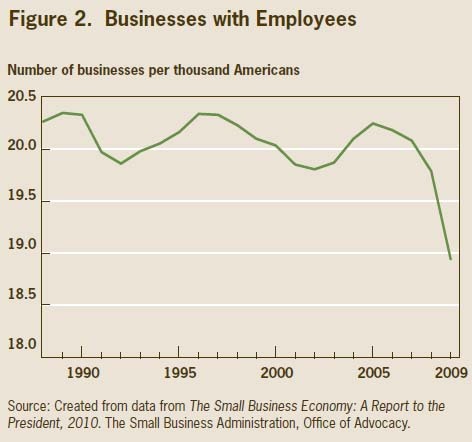 It is not coincidental that the middle class and small business are both in decline. Entrepreneurial enterprise and small business have long been stepping stones to middle class incomes and generational wealth, i.e. wealth that is passed down to future generations rather than consumed. For me the big take-away is that as fewer people in America work for small business owners who often share with employees what they did to create "middle class incomes and generational wealth", we will have fewer people who know how to do this (or even imagine it is possible). My first "real" (as defined by a job paid for by a non-family member) was pulling weeds for a neighbor (at $0.60/hour a.k.a. "a penny a minute"). I later made $1/hour when I started mowing his lawn then $2/hour until I had to stop at 14 when I started working all day every Saturday at the grocery store making $3/hour. Unlike today where most gardening jobs have a guy that does not speak English working for a guy that speaks a little English, I was working for a contractor that owned his own business and a home and was into cars (my Dad knew nothing about cars). He came over and gave us some pointers on turning a corner of our basement into a new room for me (and let us his hammer drill to make holes for the Red Heads to hold the wood to the floor). When I turned 16 he accompanied me a couple times to look at used cars (and saved me from buying a car with major rust/rot). Working in the little grocery store (owned by two butchers born in Italy), I not only learned about the retail grocery and meat business but how to patch a leaking flat roof with Henry wet patch and how to maintain HVAC systems and commercial refrigeration systems. Today in a WalMart grocery store you typically have a kid working for minimum wage doing what his "manager" (that was probably making minimum wage a year ago) doing what the latest corporate memo told them to do. When I spent a winter in Lake Tahoe getting vacation homes ready for renters, I not only learned a lot about the rental market and the real estate market, I also learned how to do low-cost home maintenance from owners that have been doing it for years and got to work side by side with them. Kids today working for a giant corporation don't have that opportunity and as a result don't learn nearly as much. Thank you, Kevin, for describing the process of learning entrepreneurial life-skills.In a neofeudal economy dominated by the government-corporate partnership, the erosion of small business goes hand in hand with an erosion of building-block skills, opportunities to learn these essential life-skills, and the cultural knowledge of how to start and operate an independent enterprise. Thank you, Thomas H. ($100), for your outrageously generous contribution to this site -- I am greatly honored by your steadfast support and readership. Thank you, Brendan W. ($10), for your much-appreciated generous contribution to this site -- I am greatly honored by your support and readership.